Oglub is an aging Orc warrior living in Dushnikh Yal, the Orc stronghold southeast of Markarth. He is the brother of Ghorbash the Iron Hand, but seems to have outgrown his chance to become chief of the stronghold. Instead, he works in Dushnikh Mine, mining orichalcum ore along with Ghak, Mahk, and Dulug. Oglub spends his entire life in the dark tunnels and never sleeps. He divides his time between hacking away on the ores, relaxing or eating. He wears a set of humble clothing, a pair of ragged trousers and boots. He carries his pickaxe, a leveled war axe, the key to Burguk's Longhouse, and a selection of common items and gold. When approached, he will tell you about his situation and why he is working in the mine: "I serve my chief and my brothers by working in the mines. It's the only place fit for an aging Orc." and "Sorry, outlander, but this old Orc cannot help you. Burguk is the chief here." He will also provide his opinion on his restless brother: "I don't know how Ghorbash has so much spirit. He should act his age." 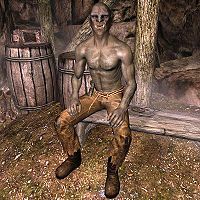 This issue has been addressed by version 1.2.6 of the Unofficial Skyrim Patch; he was missing his evening dinner package. Oglub: "You could challenge Burguk, my brother. Yours is the stronger swordarm." Ghorbash: "Serving in the Legion taught me to respect leadership. The stronghold needs Burguk." Ghorbash: "It is a fine day to work the mines." Oglub: "This metal will serve the forge well, my brother."